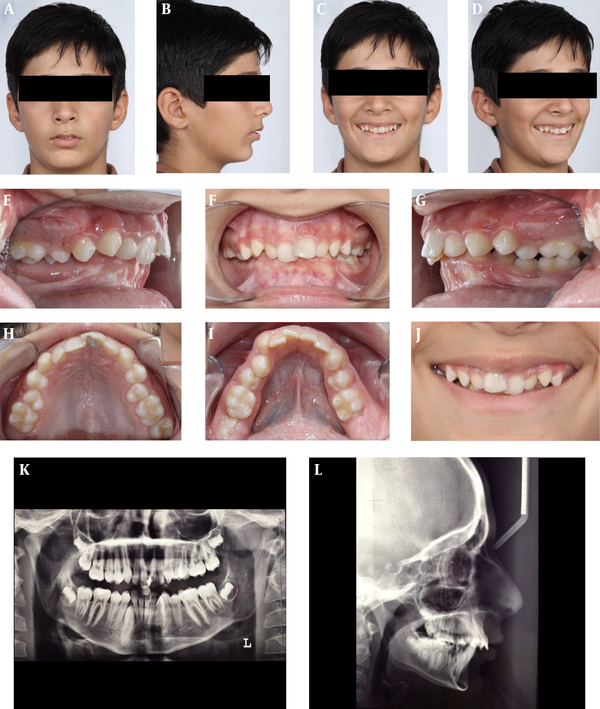 To Cite: Sodagar A, Emadian Razavi E S, Farhadifard H. Treatment of a Bilateral Scissors-Bite in an Adolescent With Fixed Appliances, Iran J Ortho. 2016 ; 11(1):e5171. doi: 10.17795/ijo-5171. Introduction: A bilateral scissors-bite is an uncommon malocclusion and its treatment is difficult. At younger age, it can be treated non-surgically. 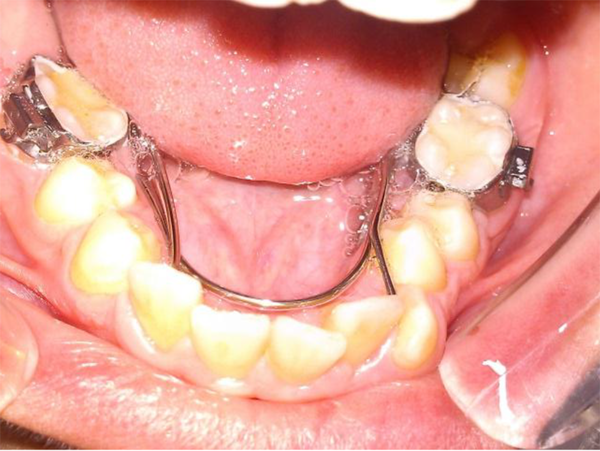 Case Presentation: This case report describes successful treatment of a class II division 2 malocclusion with bilateral scissors-bite by fixed appliance. Treatment was completed with the aid of a modified lingual arch, constricted transpalatal arch and repeated arch coordinations. Conclusions: After treatment, the patient had normal overjet, normal overbite and functional occlusion. Scissors-bite was eliminated. The patient will refer for advancement genioplasty at the proper age for more facial harmony. Copyright © 2016, Iranian Journal of Orthodontics.This is an open-access article distributed under the terms of the Creative Commons Attribution-NonCommercial 4.0 International License (http://creativecommons.org/licenses/by-nc/4.0/) which permits copy and redistribute the material just in noncommercial usages, provided the original work is properly cited. A, An illustration of scissors bite at the distal aspect (black line normal occlusion). 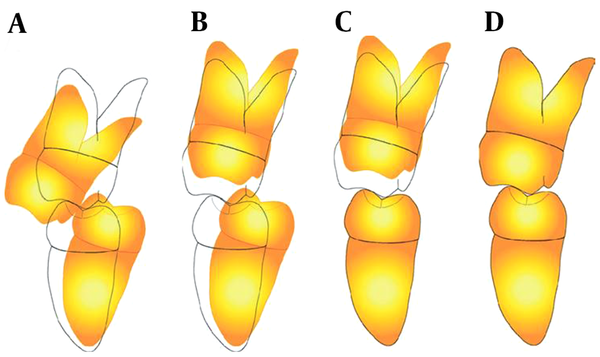 ;Intrusion and palatal tipping are necessary for correction of scissors bite, B, after intrusion and palatal tipping of the maxillary molar to allow the mandibular molar to move without resistance, the mandibular molar can easily be uprighted; C, the maxillary molar descended for settling after correction of the mandibular molar into the proper position; D, an illustration of the post-treatment appearance (1). Scissors-bite may appear as unilateral or bilateral. The prevalence is 1.0% to 1.5% of the population, so the orthodontists do not encounter it routinely in dental office (1, 2). This abnormality may not resolve by itself and if left untreated would affect chewing and muscle function and may impair normal growth and development of the mandible. So deformities like facial asymmetry and mandibular retrognathism are likely possible in these patients (3, 4). Scissors-bite commonly appears with class II division 2 malocclusion and a broad and forward positioned to the mandible. The only option for correction of the severe forms or treatment in older patients is orthodontic-surgical approach. Non-surgical options are the methods that using temporary anchorage devices, transpalatal arch and lingual arch appliances with crisscross elastics and edgewise appliance (5, 6). 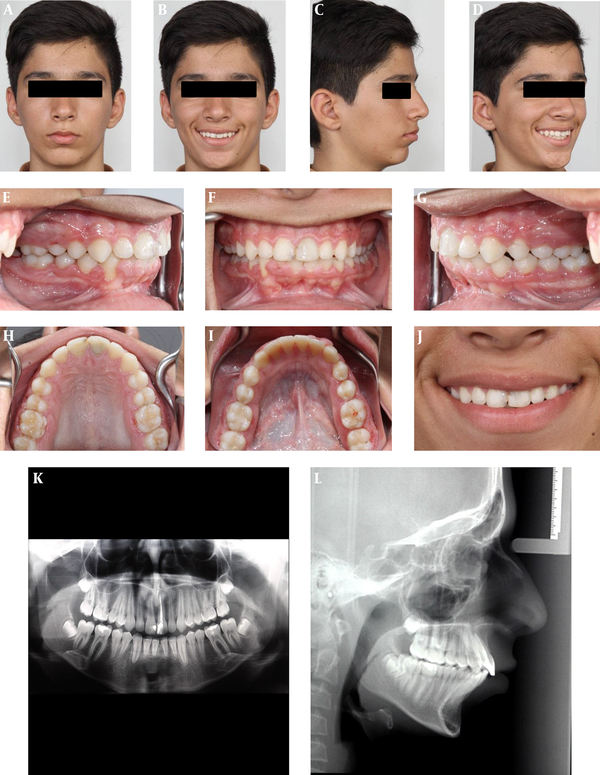 Here, we report the successful treatment of an adolescent patient with class II division 2 malocclusion and bilateral scissors-bite. The scissors-bite was due to a broad maxilla (based on Korkhause analysis), buccal inclination, and overeruption of maxillary molars. Mandibular arch was constricted and trapped in the maxillary arch. The patient was a 13-year-old boy who visited dental school of Tehran university for orthodontic consultation (Figure 2). His chief complaints were crooked teeth and difficulty in chewing. No specific medical problem was observed. In temporomandibular joint examination, there was subluxation and clicking on closing. He had a skeletal class II relationship with retruded upper incisors, deviated chin to the right, mandibular deficiency and deep bite. Posterior crossbite from the left first premolar to the right first molar was observed. Maxillary and mandibular dental midlines were deviated to right. The transverse cant of the occlusal plane was minor. There was severe space deficiency in both arches and the right mandibular canine was impacted. In the lateral cephalometry analysis (Table 1), mandibular deficiency was noticed. The major problems were summarized as chin deviation, bilateral scissors-bite, class II division 2, deep bite, midline deviation, severe space deficiency and impacted lower right canine. The patient had a slight centric relation-centric occlusion shift. Treatment objectives were correcting dental crowding, traction of impacted canine to the arch, create normal overjet and overbite relationships with good functional occlusion, and eliminate scissors-bite. We planned to constrict maxillary arch with transpalatal arch and expand the mandibular arch with an active lingual arch, with aid of criss-cross elastics. According to patient chief complaint, correction of scissors-bite was the first priority. However, in our view, correction of dental and skeletal class II relation was another major issue. Because of deep bite and reduced overjet, there was no option for growth modification at the first step. Therefore, we started the treatment with fixed appliance at the upper arch. Moreover, right mandibular canine was unerupted. As the lower dental arch was crowded and severely constricted, for traction of impacted tooth we could not extract any teeth. Therefore, we decide to expand the arch orthodontically and postpone growth modification; because it usually increases IMPA too. Metal brackets (0.022-in slot, MBT prescription) were used for this treatment. Upper arch was banded and bonded first. For initial aligning and leveling, 0.014 and 0.016-in nickel titanium arch wires were used. After aligning and leveling of upper arch, palatal miniscrew was inserted between upper right first and second premolars, for intrusion and lingual tipping of the first molar. After two weeks and before loading, miniscrew was failed. Because of patient discomfort, we did not try miniscrew insertion for the next time. 0.018-in stainless steel archwire was used for leveling. We started wire constriction from this archwire, followed by 19 × 25-in nickel titanium and 19 × 25-in stainless steel. A transpalatal arch was fabricated from 1.0 mil stainless steel to help arch constriction. It had 3-mm distance from palatal mucosa in order to help in intrusion of molars. It had slightly constricted and inserted in the lingual sheaths of the molar bands. A lingual arch with expansion arms was made for lower arch (Figure 3). It was expanded and then inserted once-a-month. After creation of proper overjet, lower arch was bonded (Figure 4). A Nickel Titanium open coil was used from initial light wires to create space for the impacted canine. When we reach to 0.018-in stainless steel archwire, and adequate space was created, the canine was referred for exposure. We choose open for technique for exposure. The elastic mechanics were used for traction of the canine and then for detailed positioning, “Piggy-back” technique was used. At this time, we removed the transpalatal arch and lingual arch. At each visit, we coordinated the archwires and instructed the patient for using criss-cross elastics. Elastic therapy and arch coordination took 6 months. The final records show that scissors-bite was completely resolved, overjet and overbite were appropriate and the impacted tooth was in its proper position. We reached a good functional occlusion and patient’s chewing function was improved (Figure 5). Canine relationship and dental midline were not ideal at the end of treatment. We suggested extraction of one premolar, but the patient and his parents refused. At the end of treatment, patient was referred to periodontist for lower arch inflammation and gingival hyperplasia. As like the other non-extraction therapies in mandibular deficiency cases, IMPA increased. We suggested the parents to perform advancement genioplasty procedure at 18-year-old to enhance his profile. By this means, Holdaway ratio would greatly improve. Like other malocclusions, scissors-bite tends to be compensated with aging. This means when we encounter this compensated malocclusion, we cannot easily constrict upper and expand lower arch; because the malocclusion would get worse (7-10). In such condition, orthognathic surgery is a good choice. Fortunately, in our case, we did not see this situation; it may be due to his young age. In this patient, deep bite, retruded upper incisors, scissors-bite, and overeruption of maxillary posterior teeth were seen. Therefore, the first step was getting more room for expansion of lower arch by aligning the maxillary dentition. Functional shift was another problem that resulted from locked posterior teeth. When we visited the patient for the first time, we thought that chin deviation might be due to this functional shift. However, with detailed examination we understood the chin morphology and different thicknesses of mandibular border at two sides are the cause. This will be resolved with future genioplasty procedure. Another problem that arises during this treatment was the increase in of IMPA and remaining class II problem. In this case, we could not use functional appliances for class II correction; because after growth modification we encounter an increased IMPA inevitably. So with that treatment plan, if we started open coil mechanics for space creation, IMPA would get worse. In the other words, in this case we plan to make a functional occlusion for the patient rather than an Angle ideal occlusion. This patient had class II division 2 malocclusion, with bilateral scissors-bite and unerupted tooth. With constricted transpalatal arch and modified active lingual arch, followed by repeated arch coordinations, we reached good alignment and functional occlusion. Future advancement genioplasty procedure would improve facial esthetics, IMPA and balance Holdaway ratio. This treatment at this age had grateful results and rescued the patient from future orthognathic surgery.